Possessing probably the most astonishing view of any holiday home in Cornwall, this former meteorological observatory is a unique place to stay. Offering 360 degree views of Falmouth, the whole of the Fal estuary and across Falmouth Bay, you will be mesmerised both day and night. Presented to the highest standards, providing luxury accommodation, this is a very special place to stay. Set on a hill, overlooking town, sea and river, The Observatory Tower occupies the highest point in Falmouth. It was built in 1868, as a meteorological observatory, where people could watch and identify incoming weather. Originally it had a parapet wall on top. Unfortunately The Tower went into disrepair over the years and was eventually sold at auction in 2009, when the new owners set about its complete renovation, restoring wherever possible. They were keen to keep the restoration as sympathetic to its heritage, while also updating it for the 21st century, to make it a luxurious and comfortable modern holiday home with every amenity you could possibly wish for. Located close to the heart of Falmouth, it is just a short 6 minute walk down the hill to the famous National Maritime Museum Cornwall as well as all the attractions, restaurants and pubs along Falmouth's historic waterfront. Highlights include Rick Stein's Fish & Chip shop and Oyster Bar. You could also enjoy a leisurely pint of local brew outside the Chain Locker pub overlooking the Custom's House Quay! If you fancy spending some time on the beach, the sand at Gyllyngvase is about a 12 minute walk away. 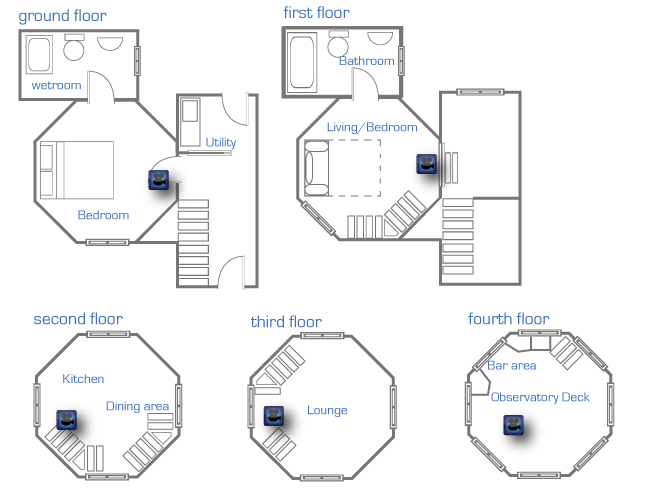 Ground Floor: A private bedroom, with 4'6" bed and TV, complete with ensuite wet-room & WC, is situated on the ground floor. There is a separate utility room which leads to a small external courtyard at the rear of the property. First floor: On the first floor is a flexible space used as a living room, but easily converted to a second bedroom when the wall bed (4'6") is pulled down. This allows up to 4 people to be comfortably accommodated. There is a separate bathroom with overhead shower & WC. Second floor: The kitchen on the second floor is both functional and interesting at the same time. The history of The Observatory Tower is depicted through photographs, plans and original weather reports, set behind a glass splashback. A bright and airy space, with rooftop views over Falmouth to north, south, east and west. Third floor: The main living room on the 3rd floor, with its large picture window overlooking Falmouth Bay, is a precursor to the top floor. Its funky sofa was specially designed to fit the space, with fabrics chosen to reflect the changes in the weather. Fourth floor: After scaling the 66 steps to the top, the observation deck on the 4th floor is what this building is all about. The 360 degree views are breathtaking and if you don't know what you are looking out at, the pelmet art above the windows will help you identify local landmarks. On this floor there is a wine fridge, a sink and facilities for making hot drinks which you can enjoy whilst taking in the wonderful views. Heating is via under floor heating throughout the property. The kitchen is fully equipped and has a range of modern equipment. There is an electric oven & hob, toaster, fridge with freezer compartment, microwave & dishwasher. There is boiling water on tap in both the kitchen and observation deck. The separate utility room has a washer dryer. In the living room there is a large flatscreen digital TV & DVD player. There is also a TV in the master bedroom. There is WiFi available at the property. There is an iron & ironing board. Electricity, heating, bed linen & towels are all included but you will need to provide your own beach towels. On street parking is available nearby. Regrettably no dogs are permitted. Strictly no smoking is allowed. Please note that due to the nature of the building, the property is not suitable for children under the age of 12. Please also note that there are many stairs in the property and some are a little narrow in places. Arrival / Departure is normally on a Friday. Falmouth, the sailing capital of Cornwall, is renowned for being the third deepest natural port in the world, a haven for both cruisers and racers offering the sailor the last major port before the 12 hour crossing to the Isles of Scilly. Visitors to the Port will find the town teeming with coastal treasures, ranging from fish restaurants and boat trips to The National Maritime Museum, Cornwall next to Port Pendennis. Pendennis Castle built in the 16th Century sits high above the harbour with truly magical panoramic views across the bay. You can ride one of the Fal River Link Ferries to the beautiful St Mawes and visit Henry VIII’s sister castle or take a delightful trip around the estuary stopping off at either Trelissick Gardens or Smugglers Cottage for a cream tea. Falmouth Regatta Week, in August is the town's major event both on and off the water, fireworks and the recent addition of the Red Arrows provides a spectacular back drop for some high class racing. Later in the year the Oyster Festival shows off the rivers heritage to the full. Pendennis Shipyard host luxury yachts for re-fit. There are plenty of places to eat & drink in Falmouth including Rick Stein's Fish & Chip Restaurant & Oyster Bar on Discovery Quay. Guest from Chilcompton stayed for 3 nights. Beautiful Views & Wonderful Unique Experience! We had a fantastic time staying here, we really wished we could have stayed for much longer. We will certainly be back sometime this year. The views are wonderful and we spent most of our time feeling we needed to return to the tower to make the most of it rather than exploring what Falmouth has to offer! It's definitely the most unique place I have ever stayed and would highly recommend it to all! Guest from Worcester stayed for 4 nights. We stayed at the tower for New Years Eve. The tower is amazing. The views are spectacular. The tower has everything you need to make your stay comfortable. Lots of stairs!! Guest from Clacton On Sea stayed for 5 nights. Guest from Mexborough stayed for 7 nights. We stayed at the Observatory Tower for a week in late October. What an amazing building. The building is finished to a very high standard and is immaculate throughout. The views are outstanding from every window. We had the best time. Falmouth is a wonderful town. We especially enjoyed the boat trip up the river. I would highly recommend this unique lodging. We have had yet another fantastic stay in our favourite tower, and are already looking forward to 2019! Cornwalls Cottages and the property owners were most attentive regarding the faulty dishwasher - which we would never use anyway! The welcome pack was much appreciated after a hard afternoon at the Falmouth beer festival on Discovery Quay. Cannot rate the Observatory Tower and Cornwall Cottages highly enough. Excellent from start to finish, the location is beautiful with lots to do, very conveniently located for the town and harbour. The OT itself is beautiful - very thoughtfully restored and finished to a very high standard with excellent use of the space available. Lovely and clean, beautifully presented and well equipped. The fresh flowers, cider and tea caddy were a lovely surprise and a nice touch. We would definitely return, and definitely use Cornwall Cottages again - great service throughout. Thank you! Made our holiday one to remember. We enjoyed our stay but a week was long enough. It is a unique experience and one that I would recommend, however it does become quite tiring by the end of the week. If you want to enjoy a drink on the top floor, you have to come down three floors to go to the toilet. The stairs are quite steep, so it is difficult carrying shopping up the stairs. The only place to eat, if there are four of you, is the top floor, so all food has to be carried up there to be consumed. Some of the kitchen utensils were very dirty in the drawers so we were put off using them. The views of Falmouth are amazing and the history of the building is fascinating. The location of the tower is good for getting into Falmouth and we found loads of great places to eat there. It was a shame the Camera Obscura wasnt working. There was a light permanently on in the ground floor bathroom which was annoying because if someone wanted to go to the toilet in the night, it was very bright and would wake up the other person sleeping in the room. The owner came round on the first day and said it was being fixed, but unfortunately this didnt happen within the week. There were some lovely touches, such as fresh flowers and local cider left for us, which was very thoughtful. I feel fortunate to have had the opportunity to stay in the tower because it is a great experience to have such views and stay in a historic building. Guest from Eastleigh stayed for 7 nights. I was lunch to secure a booking at the tower last minute and I had a great week enjoying the views and Falmouth itself. The views from the observatory are truly stunning and the finish inside the property is excellent. Parking can be a challenge on the streets surrounding the property but spots can be found depending on timing of when you return to the property - I didn't drive much during the week so it wasn't really a problem. I have stayed in a number of luxury cottages in Falmouth and the finish inside was second to none - my only feedback would be the properties at the luxury level have kitchens that are better equipped in terms of oils and condiments for cooking. If you are staying at the tower be prepared to bring your own down (which I used to do) or buy some locally when you arrive (which I had to). Overall an amazing place, well located and the views really do have to be experienced! This is the fourth time we have stayed in The Observatory Tower in as many years, and always enjoy it, whatever the weather. The 360 degree views from the top floor are well worth the climb up the stairs, and one can spend many hours searching for landmarks, watching river traffic - and even fireworks over St Mawes Castle! The architect and interior designer have done a wonderful job in making best use of the structure; it's cosy but not cramped, it's well-equipped in a contemporary style without being cluttered, and is a wonderful asset to Falmouth's architecture. We also noted that it has been decorated this year! The location is prominent but in a quiet part of the town. It is perfect for walking into the centre (as long as steep inclines and steps aren't an issue), and as it can be seen from various places such as Princess Pavilion, Pendennis Castle and St Mawes ferry, one can always get one's bearings if not familiar with Falmouth's layout. This is a fabulous place to stay as the view is simply stunning and Falmouth offers lots of good restaurants in easy reach. we certainly felt fitter at the end of it with the hill climbing and the stairs but it was always worth climbing up to the view at all times of the day and in all weathers. The property has been thoughtfully restored and is very comfortable and well equipped. A fantastic conversion of this observation tower, everything is done to an excellent standard so that even when it rains (occasionally) you can enjoy being inside. Spending time on the observation deck is a joy with uninterrupted views of the spectacular estuary, coast, town and countryside. This is a holiday let which adds to your enjoyment of the holiday, how many times can you say that? Guest from Aspang stayed for 7 nights. We enjoyed our stay in the observatory tower in falmouth very much. The highlight was the view of the observatory deck in a 360 degree view. It is just a short walk (10 min) to the city and the piers and a 20 min walk to the beaches. There is no dedicated parking space by the tower but it was very easy to get a parking space on the roads within 3 min walking distance. The observatory tower is a wonderful place to stay and is extremely well located. We really liked the mix of younger and older people in Falmouth and the excellent boozer by the harbour, which serves a fantastic array of ales, pale ales, lagers and ciders. We recommend the Breton dancing on a Monday evening! The tower is comfortable, modern and, naturally, has wonderful views from the top floor. We would only suggest some comfortable chairs for the observation (top) floor so that one can read and take in the glorious views! This was our third stay at the Observatory Tower, and the second stay by our fellow guests. Yet again it was a magical week, thoroughly enjoyed by all of us. Comfortable and clean, and good exercise! The main issues for your consideration: 1. During preparation of one of our evening meals, the ring main tripped. We were unable to identify the actual cause, but it was most likely the microwave, as we used it only the once, and no other power outages occurred during our stay (none has occurred during our previous stays, but we have not used the microwave before). It might be worth checking electrical isolation for the property, or the potential to overload the circuit. 2. The flush for the first floor toilet is a little erratic, and would benefit from maintenance. 3. The shower screen for the first floor bathroom leaks at the seal between the two panels, requiring a mopping up exercise each time the shower was used (no great hardship). As this is a design fault, I'm not sure it would be easily rectifiable. 4. It would be preferable for the hair dryer to be placed in one of the drawers in one of the bedrooms. The last place I expected to find it was in the ground floor bathroom cabinet! I hope this is helpful. Guest from Harrogate stayed for 7 nights. Guest from Diss stayed for 7 nights. We are home, but can't wait to return- such a fabulous place to stay, the views are amazing and never tired of it. The observatory was a definitely one of a kind place to stay and Falmouth itself had lots of things to do and we could have happily spent a further week there. We had the pleasure of meeting the owner a really great guy who gave us lots of pointers for things to do. The ferry trip to Truro being one of them which was a great day out. The Pandora inn being another of them. The observatory itself had everything you could wish for and was clean and tidy and suited our family well, often we were all on different levels of the observatory just enjoying the views or the peace. Can't wait to return. Guest from Porthcawl stayed for 7 nights. From the moment we arrived at the Tower we were blown away with the views and although the pictures we saw on the booking website were good, they just can't do justice to how amazing the views actually are. The quality of the refurbishment is excellent and every detail has been considered. We felt very privileged to stay in this historic building. The surrounding area is quiet but really close to town and although there is no dedicated parking we didn't have trouble finding somewhere fairly close each time. A small price to pay for staying somewhere so lovely anyway :-). I'd also recommend booking with Cornwalls Cottages too as they were professional and helpful from start to finish and everything was arranged without any fuss. An unusual and fantastic place to stay! The views from the tower, especially from the top floor, are stunning and the stairs (plus the walk from the town up to the tower) will improve fitness. The tower has been updated with high quality fittings that make great use of the space available. Several ways to walk into Falmouth from the tower and it's fun to look back and see where you are staying when crossing to St Mawes on the ferry. Would highly recommend for couples or up to four people; be aware though that there are two double beds so not suitable for all family groups. Will visit again! A very unusual property, Beautifully restored , almost like staying in a lighthouse ,fabulous views from top deck . Extremely well equipped . Stairs were quite a challenge for folk well into their seventies but well worth the effort.Early evening wine and nibbles on observation deck ,not to be missed. Guest from Bury St Edmunds stayed for 7 nights. Great stay at the Tower!! The Tower exceeded my expectations!! On arrival we were greeted with a bouquet of flowers on the kitchen table, a bottle of local cider and a pint of milk in the fridge which I thought was a really nice touch. The Tower itself has been finished/restored to a very high standard. It was immaculately clean and had everything you would need for your stay. The view from the top was stunning!! Great place to be with a glass of wine watching whats happening in the bay and harbor!! We had a great stay and would love to come back again!! Guest from Wales stayed for 7 nights. We can't recommend the Observatory tower enough it's in an excellent location with great facilities .There are fantastic view all round the coast and up the Fal . Enjoy your time watching the comings and goings of the yachts and assorted ships and the unloading of produce on the dockside.....FAB work out on the stairs ... we can't wait to go back!!!! Our stay at the observatory, the building was spotless and the views from the top were amazing. Feeling a lot fitter for climing the 66 steps. Thanks for a great stay. If you want something different then this is definitely worth a try - everything is fitted out to a high standard, and is beautifully clean and well presented. The kitchen is very well equipped, with all of the utensils and supplies you could ask for - even down to dish cloths and washing up liquid. The 360 degree views from the top are amazing, and you can watch some lovely sunsets and sunrises. We had a couple of minor issues with the heating system in early March, but the owners dealt with it very efficiently. I would highly recommend a short walk down to the Harbour Lights fish and chip shop - one of the best in the country without doubt. Pendennis Castle is also well presented and worth a visit. Overall an excellent break away, and we would definitely visit again. Well done to the owners for refurbishing this historic building and making it available to the lucky few. Guest from Rickmansworth stayed for 7 nights. I cannot recommend the Observatory Tower highly enough. It is a very magical place to stay because of the spectacular views it offers, the high end comfort and attention to detail and because of its fantastic location in the heart of Falmouth. The tower is luxury accommodation and everything has been thought about to ensure your stay is relaxing and highly enjoyable. For us it had all the feel of a high end hotel, but with all the charm of a holiday cottage. I didn't know which room to enjoy first! Although ultimately the view at the top won! It was such a wonderful place to watch the world wake up, watch the weather change and see the sunrise and sunset. The location was perfect being in walking distance of the sea front, the harbour and the high street. Falmouth was amazing for food, entertainment and coastal walks. We were sad to leave and hope to return as soon as possible! If you are looking for somewhere special to escape from the world, to enjoy the passing of time and the enjoy the good things in life this is the place for you in any season! Guest from Rudgeway stayed for 3 nights. The Observatory Tower lived up to expectations raised by online photographs and description. We enjoyed the luxury of our surroundings as Storm Imogen raged. A holiday home with a difference- and stunning views. Excellent accommodation, very clean and all fittings were high quality. Location is amazing with excellent views but parking could be tricky- we didn't have any problems parking on our stay. We are already planning our next stay! Our second stay in this unique building. Brilliantly and tastefully appointmented with spectacular views across the estuary and coast. Highly recommended. Guest from Ipswich stayed for 3 nights. The observatory tower is one of a kind, fantastic views by day and night,whatever the weather. very comfortable and warm with excelllent facilities. Did not disappoint.would recommend to anyone who wants somewhere unique to stay in this lovely town. The Observatory Tower is a wonderful, unique building that has been very well and tastefully refurbished using quality fittings. Our preference is to stay at different properties when we come to Falmouth for the beer festival, but we have fallen in love with this one, and this year is our second stay. In addition, friends who stayed with us this year and last have also been impressed with the property. The narrow streets mean that loading/unloading and parking are issues, but once parked, we did not use the car for the whole of our stay; walking is our preference, and the ferry and bus links are so good, even though bad weather can disrupt ferry links on occasion (the week we stayed was no exception!). We were pleased to find that the washing-up bowl we bought last year to fit the kitchen sink was still on the premises, and made good use of it. There are a couple of 'snags' that require attention; the shower screen in the first floor bathroom leaks, and the boiling water dispenser on the top floor needs maintaining (we chose not to use it). On a selfish basis, we could have benefited from an additional utility area for our wet running gear - but we managed. The welcome pack was a pleasant touch, especially the flowers, and it was good to meet the cleaners just before we departed. Guest from Schwäbisch Gmünd stayed for 7 nights. An amazing building beautifully updated makes even wet weather good as staying in is as fun as going out. Falmouth and the Tower are the best holiday. Guest from Amlwch stayed for 3 nights. unique place to stay fantastic views and really well presented in every way. just one down side no parking not good on the street but plenty of car parks within short distance. Guest from Birmingham stayed for 10 nights. We had an excellent time with the 360 degree view of Falmouth and surrounds. Christmas decorations were a welcome surprise. Our grandson loved it too! a unique holiday home with all the comforts. the only pain was the parking, this can be very difficult returning late evening. The views from the tower were amazing especially in the evenings. Guest from Rawtenstall stayed for 7 nights. We have stayed at the Observatory Tower before and had no hesitation booking again. It is quite simply a luxuriously appointed venue in a superb and unique location. Guest from Basildon stayed for 7 nights. We were very excited on entering this tower and amazed at how much is put into it for convenience and enjoyment during the stay. Everything is thought of except perhaps privacy, but perhaps I am being niggly here. We are an older couple (mid 60s) so it probably means more to us but there are only blinds on the bedroom windows and all the landings going up from each floor and the kitchen and lounge are fairly bare so at night you can be seen moving round even though you are a fair way up. We were lucky to have a fantastic week of very good weather so late in September but I imagine this can make it feel cold in the winter with nothing on the windows. also the lovely modern seating in the main lounge is not that cosy or comfortable after a while watching the tele. You sort of want to put your feet up but you cant. I don't mean to be negative as I say we are an older couple and these things haven't bothered anybody else so I would definitely recommend a stay here and would also stay again myself if I had the chance. The welcome pack of cider and biscuits of a good quality were very welcome indeed as was the milk in the fridge and a very kind thought by the owners and I am very sorry and embarrassed about phoning the owner to ask where the kettle was as I did not notice the boiling hot water tap at first. Thank you for explaining it to me very patiently Allen. Later on I did see the folder of explanation of this and other items in the accommodation and read it cover to cover. Thank you. Guest from Halle/saale stayed for 7 nights. The observatory tower is a wonderful place to enjoy the holidays in Cornwall. It is not really cheap, but it`s worth it in any case!!!!!!!!! The tower is well equipped, everything was clean and fully functional. And finally, the 360° view over Falmouth, the port and the Cornish coast is an unforgattable experience!!! The observatory tower is a fabulous place to stay. It's restored to perfection with comfortable classy fittings and such a clever use of space. Soft white Egyptian cotton bedding, swanky bathrooms, beautiful kitchen with boiled water tap, sound systems for your I pod, a great big TV and to top it all a wine fridge on the observation floor! From the top floor you can see incredible views of the town, port, harbour and countryside stretching for miles around. If you want to play at being king of the castle for a week then this place exceeds all expectations. There is a sandy beach within walking distance and a ferry to idyllic picturesque coastal towns. Pubs and delectable fish restaurants are all just a short walk away with coastal paths to wander in every direction. We didn't use the car for the week and managed to visit so many different towns and places every day by ferry or on foot. Falmouth train station is minutes walk away and we had planned to venture further afield but there was just so much to do and see right on our doorstep! Guest from Ammersbek stayed for 7 nights. Guest from Stoke On Trent stayed for 7 nights. The property is well laid out and had everything we needed, the view from the top of the tower was amazing. The property was very clean, and surprisingly spacious for the four of us. The only negative was trying to park the car, especially in the evening on a couple of occasions we had to park quite a few streets away but it was only a small inconvenience to pay for staying in such a unique building. An imaginatively presented three storey town house with some great modern design features, located just up the hill from Custom House Quay, the Maritime Museum and Event Square in the heart of Falmouth. It also has the benefit of a private garage. Located within the quiet and secure gated Port Pendennis Marina Village just moments from the National Maritime Museum Cornwall in the heart of Falmouth town, this delightful apartment comes with excellent views of the marina and extensive shared gardens including the use of a tennis court, this is a brilliant place to stay when visiting Falmouth. Harbour Cottage, with its spectacular sea views overlooking Flushing, is perfectly located in the heart of Falmouth and is ideal for watching the boats sail around the beautiful historic harbour. This holiday cottage is a short stroll to the centre of Falmouth, with its wonderful selection of restaurants and bars. With its sunny garden and tremendous views it is a wonderful place to enjoy a glass of wine in the evening sun! Dog friendly. Pipit is a delightful, bright apartment located in the grounds of Falmouth Hotel with fantastic views of the bay with glistening seas and golden sands. It is a short walk to Event Square which is bustling throughout the year and there is a vibrant restaurant culture. A fantastic property for a couple's getaway. New Quay House is the most fabulous, spacious, Grade II listed, part Queen Anne, part Georgian property with the most stunning panoramic views over the water in three directions. There is a private garden with a summerhouse right at the water’s edge and the whole house oozes peace and tranquility. Originally constructed in 1703 this beautiful property on the waterfront in Flushing was originally the home of a Merchant Ship Captain. It is Grade II listed and is a superb place to stay overlooking the river. New Quay Lodge forming part of the building, is full of history & character. It also benefits from a quite exquisite private garden to the rear which gets sunshine for much of the day. Private off road parking is available. One of our many luxury dog friendly holiday homes. This is a great location with wonderful views across the river to Flushing and a superb master bedroom with Juliet balcony which really makes the best of the magnificent view. It is a short walk into the vibrant, bustling port of Falmouth which has a wealth of great restaurants, traditional pubs and a huge variety of shops. Located just opposite the quay with its stunning seafood restaurant and within easy walking distance to the village shop and two pubs, Jacquey's House is a great place to stay. Immaculately presented cottage, within a few yards of the sea in the heart of the picturesque village of Flushing. Spacious accommodation which blends a contemporary feel, traditional features and a stunning first floor, south facing, private, sun balcony. This cottage will guarantee a memorable holiday in a fabulous location.